Originally published at Siam Voices on October 29, 2013 Last week, we reported on the attempts by MPs of the ruling Pheu Thai Party (PT) to amend the amnesty bill draft to include those affected by groups or organizations set up after the military coup of 2006. The original draft by PT MP Wocharai Hema pardons protesters involved in the numerous political protests in recent years, but not their leaders and authorities involved in clashes during these events. Now with the planned rewrite - spearheaded by PT MP Prayuth Siripanich, the deputy chairman of the parliamentary vetting committee of the bill - it could mean that a number of politicians and officials under investigation or already convicted could be acquitted, including former prime minister Thaksin Shinawatra. 3. The differences in solutions to the problem derived from the dissimilarity of opinions. Some MPs believe that amnesty bill should be priority after the formation of the government but the UDD believe that constitutional amendments and the eradication of coup consequences should be the primacy. However, since three years have passed and thousand remain convicted, the amnesty for political prisoners of all colours became the immediate policy of the UDD which resulted in the organization’s proposal for the amnesty bill that was later transformed into the original version of MP Worachai Hema’s bill. 4. One of the core problems is the group of people who will receive amnesty. In the case of former PM Thaksin Shinawatra who was victimised by the consequences of coup d’état, he should be granted justice through the elimination of coup consequences, not via amnesty bill. The amendment of article 309 is the right way to help Thaksin and it should be abolished. In essence, the UDD opposes the notion of a rewritten amnesty bill that would see political and military officials not punished for the events of 2010, while at the same time suggesting an alternative route to undo the conviction of former prime minister Thaksin Shinawatra via constitutional amendments, which are another hot issue the government is currently facing heavy flak from the opposition and especially Section 309 seems to be very protected by the Democrat Party. In the aforementioned Section 309 of the 2007 Constitution, the coup makers are essentially granted an amnesty since their actions and their consequences are declared constitutional, including the set-up of government agencies. One of them was the Assets Examination Committee, whose investigations led to a conviction of Thaksin in 2008 for abuse of power in a land purchase by his former wife and his self-imposed exile to avoid a 2-year prison sentence. The same conviction would be overturned by the rewritten amnesty bill. On Sunday, around 300 red shirts of the Red Sunday Group of activist Sombat Boongam-anong (which is considered as a more progressive splinter group) returned to Rajaprasong intersection in the center of Bangkok - where most of the 2010 protests took place - to show their disappointment in the proposal, with Sombat accusing the Pheu Thai Party and Thaksin of failing their followers. Prior to that, the families of the 2010 protest victims have also voiced their opposition to it. 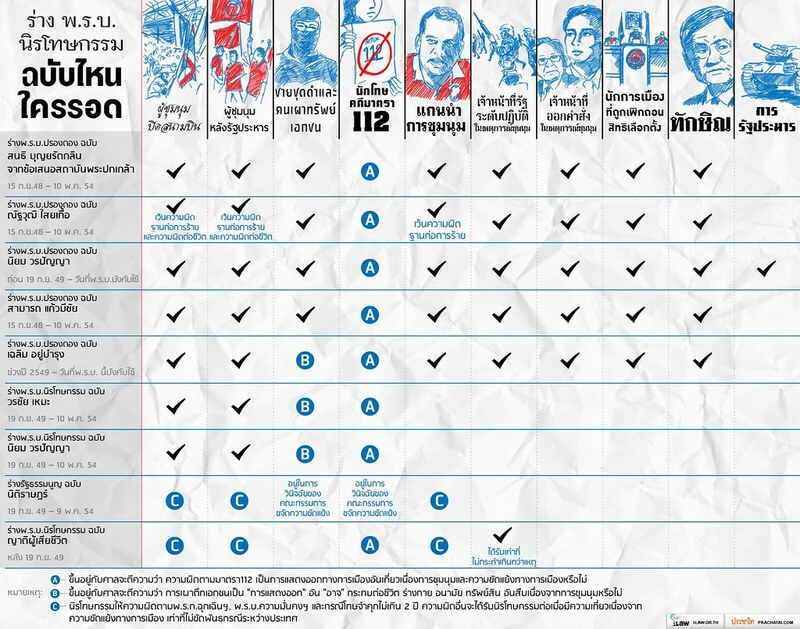 Despite the apparent controversy the ruling Pheu Thai Party has created among their own ranks, it is very doubtful that this could result in a backlash that is sizable and influential enough to revert it or even a "mutiny" as the Bangkok Post suggests, since the red shirts have already stated not to protest against the government should the bill pass in this form. It is obvious the ruling Pheu Thai Party is willing to bank on a big political gamble that (while maintaining a comfortable majority in parliament) could alienate those parts of the supporter base that want to see justice for the deaths of the 2010 protests, one of the campaign promises that brought them to power in the first place. UPDATE (Tuesday, 8.00pm): In a decisive push forward, parliament will meet on Thursday, October 31, to deliberate the amnesty bill in its second reading according to several media reports. What also emerged that the Pheu Thai Party passed a resolution that all its MPs, including the red shirts, are required to attend and all should vote in favor of the bill. The vote on the third deliberation is planned to take place on November 2. Originally published at Siam Voices on August 16, 2013 Over three years after the deadly military crackdown on the anti-government red shirt protests, battling narratives on what happened that day are still defining the current political climate - even more so with the debate on the government-sponsored amnesty bills and the release of an official inquiry report that fundamentally contradicts with recent court rulings. On May 19, 2010, after nine-and-a-half weeks of anti-government protests and street occupations by the red shirts, the military staged a bloody crackdown. With the previous clashes since April 2010, at least 90 people were killed and thousands injured, mostly civilians. The chaos and carnage has left a gaping wound in the nation's psyche that still hasn't healed. Not least because the questions surrounding what exactly happened and who is responsible for the deaths are still the subject of intense argument across all political allegiances, mostly with little facts and much hyperbole. Last year, the Truth for Reconciliation Commission of Thailand (TRCT) released their final inquiry report into the events of May 19, 2010. The panel, set up during the administration of then-prime minister Abhisit Vejjajiva with virtually no powers or access, found faults on both sides and was promptly criticized and dismissed by both sides. The report, around 90 pages long, can be summed up in 2 points: that the security forces did commit several inappropriate actions - such as dropping teargas from the helicopters onto the crowd below and censoring a number of websites - but the bigger issue is that it was the Redshirts who "violated human rights" by engaging in unlawful protests and provoking the authorities. The NHRC report fails to point the finger of blame at the military for the deaths, which Abhisit and his then-deputy prime minister Suthep Thaugsuban are now facing murder charges by the DSI. Especially foggy are the circumstances, in which six civilians were killed inside Wat Pathumwan, that are described by the NHRC inquiry ("killed outside and then dragged inside the temple grounds"). In fact, they were disproved in a landmark court ruling just a few days earlier that explicitly found the military responsible for the deaths - which was instantly rejected by army chief General Prayuth Chan-ocha, back then one of the key commanders of the crackdown. Expectedly, the NHRC report was met with heavy criticism with accusations of whitewashing the crackdown, since it also seems to be reinforcing the same official line that has been touted by the authorities and the Abhisit government back then in 2010 and is still insisted upon today by the now-opposition Democrat Party and its supporters. Given the political affiliations the NHRC head Amara Pongsapich and the circumstances that led to her appointment, the report is hardly a surprise, but a disgrace to the National Human Rights Commission's task. The May 19 crackdown was also a central issue of the parliamentary vote of the so-called amnesty bill last week. From the various draft bills that have been suggested (including one by families of the Wat Pathum victims strangely supported by Abhisit), the government led by the Pheu Thai Party (PT) submitted the draft of PT MP Wocharai Hema, that grants all political protesters amnesty - including the various yellow and red shirt protests since the 2006 military coup - but does not include the protest leaders and authorities responsible for the crackdown. The bill was initially passed by the lower House, but has to vetted and submitted for vote again. The heated exchanges during the debates saw both political sides occupying their narratives to the events of the violent clashes during the red shirt protests of 2010. One such moment included Democrat MP and former deputy PM Suthep insisted that no snipers were deployed in the dispersal, despite secret documents stating the contrary. On Thursday, the Bangkok Post published a column by Democrat deputy leader Korn Chatikavanij voicing his opposition to the amnesty bill, accusing the government for a lack of "any genuine desire for reform or reconciliation" and points to the TRCT panel that was set up by then-PM Abhisit (but gave it virtually no powers whatsoever), cites the "objections from the UN human rights office" (although the UN OHCHR only cautioned and then clarified it didn't object the bill at all) and (mistakenly?) references the NHRC as "our own Human Rights Watch", while during the Abhisit government he and his government regularly blasted the findings by HRW and other international human rights organizations. What all these events in the past week show is that the wounds of what is considerably the worst political violence in the Thailand's recent history still have not healed, because not only are competing truths evidence of an ongoing divided political discourse, but also the very likelihood of repeated impunity for the authorities and the military for the May 19 crackdown still prevails, something that has been practised too often in the country's history - 1973, 1976, 1992, 2006, just to name a few - in the short-sighted hope that all is forgotten and forgiven until the next tragedy.